LG LW8016ER is a window air conditioner. Its capacity is 8000 BTU. It’s a cooling only model. It’s a white color unit with blower on the top left and center and control on the top right. Front of the air conditioner is made up of plastic while rest of the machine is made up of metal. LG LW8016ER cooling capacity is 8000 BTU. This is sufficient to cool around 340 sq. ft. of area. It consumes 660 watts. Its EER ( energy efficiency ratio ) is 12.1 which is cooling capacity to power consumption ratio. This makes it pretty efficient. CEER (combined energy efficiency ratio) which takes into account the energy used while the air conditioner is running as well as the standby power used when the unit is not running but is powered on is 12. Dry air flow is 220 CFM (cubic feet per minute ) Indoor sound level are 54 db which is not in the league of split type air conditioner but pretty silent for a window air conditioner. It uses R32 refrigerant which is environment friendly and efficient. 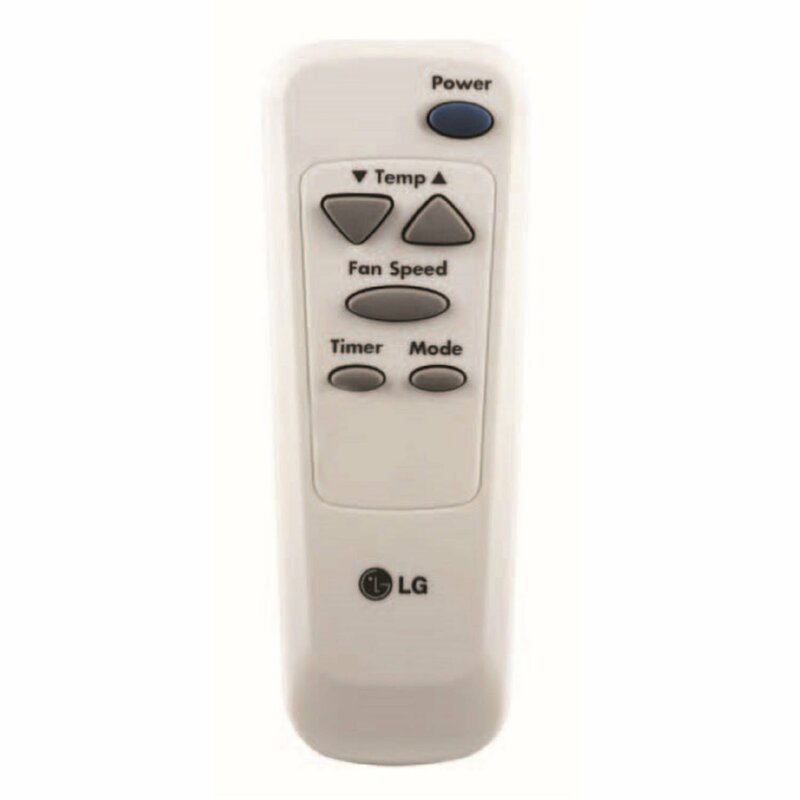 LG LW8016ER comes standard with remote control. But there is no display on the remote which is expected from this price range air conditioner. Other features include auto restart, energy saver function, on/off timer, filter alarm function. It has 3 speed cooling. Air deflection is 4 way. It has a rotary compressor. LG LW8016ER depth is 19.6 inches, width is 19.4 inches and height is 12.4 inches. Net weight of the machine is 58 lbs. Shipping weight is 65 lbs. There is a thermistor for thermostat control which allows the compressor to shut down automatically once the desired temperature is achieved. The auto restart feature will automatically turn on the AC with previous settings if the power is switched off and then on back during operation. The remote control comes with on-off function, temperature up and down function, mode selection function, On off timer function, sleep function and swing function in it. Energy saver function in LG LW8016ER minimizes the power consumption for optimal cooling. 24-hour on-off timer allows you to on or off the air conditioning unit Automatically after the desired interval of time. Filter alarm function lets you know Whenever air filter is clogged and cleaning is required automatically by glowing Clean filter light. Air conditioner has 3 fan speeds low, medium and high to choose with while running the air conditioner. There are different mode indicators like cool, fan, dry and energy saver on the air conditioning unit itself which allows you to conveniently see in which mode the air conditioner is running. There is also a temperature display on the air conditioning unit. Air conditioner also has a outdoor vent or exhaust in the unit. 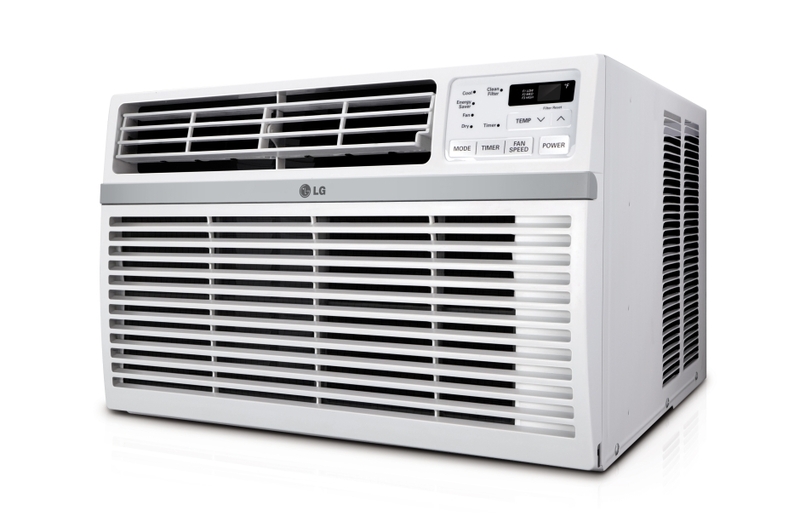 LG LW8016ER is fairly simple to install compared to a split type air conditioner. Compressor is there within the blower unit only. So you don’t need to assemble the indoor unit or fan unit with the outdoor unit or condenser. Yes there are some vibrations and noise because of condenser being built within the blower unit only. But these are also well within the limit for a window air conditioner. Being a window air conditioner it is also much more reliable and efficient than a portable unit. Cost is also pocket friendly which makes it a very good option. LG LW8016ER is cheap to buy and low on power consumption. So we can easily make out that it’s an efficient and pocket friendly machine. It has excellent cooling and fairly quieter from window air conditioner standards. It uses environment friendly R32 coolant. LG is a reliable brand. Unlike an central air conditioning system if there is a problem in this machine it won’t affect the entire house but only the room this particular air conditioner is catering to. Agreed build quality is little flimsy but it is still very much acceptable at this price point. It is also very attractive looking and ergonomically well designed air conditioner. Last but not least is it’s fairly easy installation. So if you have a window to instal it this is one of the better bet. Absolutely recommended product.